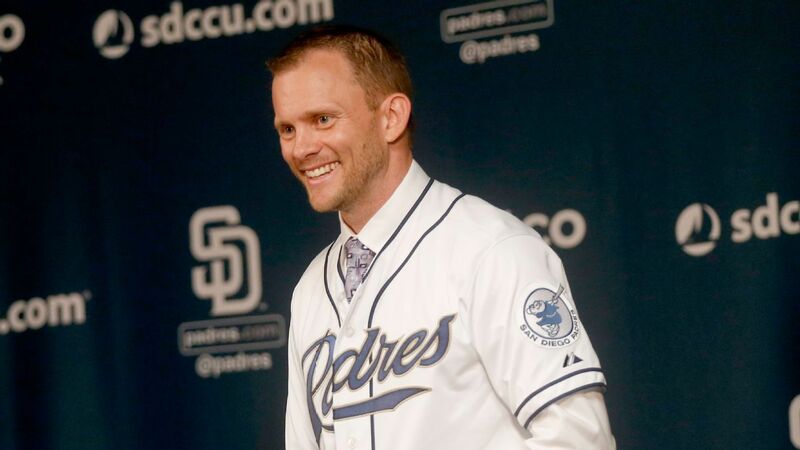 Former South Bend Silver Hawks infielder Andy Green was introduced Thursday as the new manager of the San Diego Padres. Green spent the past five seasons coaching in the Arizona Diamondbacks organization. After managing rookie-level teams in 2011 and 2012, he took the helm of the Double-A Mobile BayBears for two seasons and was named the Southern League Manager of the Year in both 2013 and 2014. He served as Arizona’s third-base coach during the 2015 season. Before he was a coach, Green played 11 years for the Diamondbacks, Cincinnati Reds, and New York Mets organizations. He played 140 games in the major leagues (136 games with the Diamondbacks and four with the Mets). His first full season as a professional ballplayer was spent in the Midwest League, where he batted .300 with 5 HR, 59 RBI and 51 SB in 128 games with the 2001 Silver Hawks. He also played three games for South Bend in 2000, going 0-for-9 but reaching base twice on hit-by-pitches. Green’s hiring came as a surprise, as reports had former Minnesota Twins manager Ron Gardenhire and Pittsburgh Pirates third-base coach Rick Sofield as the frontrunners for the Padres managerial job. Both Gardenhire and Sofield are former Midwest Leaguers. Gardenhire started his managerial career in the Midwest League, as skipper of the 1988 Kenosha Twins. The team posted a 81-59 record in the regular season, and lost to the Cedar Rapids Reds in the championship series. Sofield played in the Midwest League, batting .238 with 4 HR and 55 RBI in 104 games with the 1976 Wisconsin Rapids Twins. Pirates manager Clint Hurdle — for whom Sofield is now a coach — was named the MWL Prospect of the Year in 1976 after batting .235 with 19 HR and 89 RBI in 127 games for the Waterloo Royals. The Detroit Tigers hired Rich Dubee as their new pitching coach, the team announced Thursday. Dubee was pitching coach of the Florida Marlins from 1998 to 2001, and served in that same capacity for the Philadelphia Phillies from 2005 to 2013. He briefly pitched in the Midwest League, making two starts for the 1976 Waterloo Royals (for whom Clint Hurdle played, as mentioned above). Dubee won both games. He gave up six runs (three unearned), struck out seven, and walked nine in 12 innings. The White Sox acquired RHP Jacob Turner from the Cubs in a waiver deal last week. Turner spent half of the 2010 season with the West Michigan Whitecaps a year after being drafted No. 9 overall by the Detroit Tigers. He went 2-3 with a 3.67 ERA, 51 strikeouts and nine walks in 54 innings. He made his MLB debut for the Tigers in July 2011. Former big-league outfielder Adron Chambers was suspended for 50 games Tuesday after a second positive test for a drug of abuse. He currently is in the Cubs organization and played for Chicago’s Triple-A team this year. Chambers played 84 major-league games for the St. Louis Cardinals between 2011 and 2013. As a Cardinals farmhand he played for the 2008 Quad Cities River Bandits, batting .238 with 3 HR, 25 RBI and 13 SB in 95 games. This entry was posted in Cedar Rapids Kernels, Midwest League, Mobile BayBears, Quad Cities River Bandits, South Bend Silver Hawks, Southern League, West Michigan Whitecaps. Bookmark the permalink.